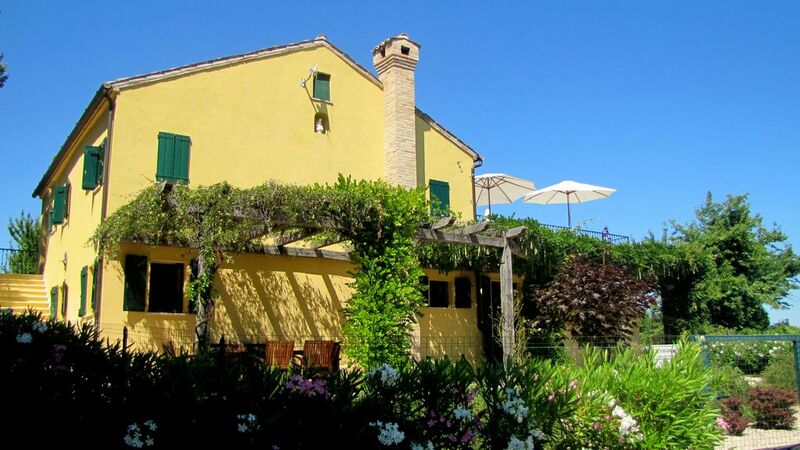 300 sqm Farmhouse with Pool, absolute Privacy + plenty of space. Casa Madi is a large 100 year old traditional farmhouse, located on top of a hill with stunning views over the surrounding area. The house and barn have been restored to practical modern standards, retaining much of their original character, yet bright and airy. The kitchen/dining area is large and open-plan, the living room is spacious (10x5m), and the bedrooms are well-sized andlight. A large 16x6m upper terrace provides commanding views of the countryside and is a stunning setting for outside lunches and dinners. A lower level portico provides for a well-sized U-shaped rattan sitting area, ideal to escape the heat during the day and perfect for sun-downers in the evening. The lower portico is also ideal for barbecuing. This then leads up to a 5x10m pool with a further patio area with ample space for relaxing. The house has a further patio at the front, shaded by wisteria. The property is totally private and offers plenty of space for everyone. Bathroom 1 on the upper floor (for 2 bedrooms) with wash basin, shower, WC, bidet. Bathroom 2 on lower floor (for 2 bedrooms) with double wash basin, shower, bath, WC. Rustico Bathroom with washbasin, shower and WC. 50 sqm spacious bright downstairs sitting room with TV screen and DVD player. Cast-iron stove for cool nights. The Rustico offers its own sitting area, with own cast-iron stove. Nescafé Dolce Gusto machine available - bring your own capsules as they are difficult to obtain locally! Large, well equipped modern kitchen with oven and hob, dishwasher, fridge, micro-wave and all modern utilities. Open-plan with dining room. The Barn is self contained and has its own modern kitchenette. Notes on accommodation: Casa Madi is a non smoking house. We consider the house to be unsuitable for children under 6 years of age. Outside: The size of the property is roughly 3,000sq.m, mainly laid to lawn; mature trees around, little visibility from the outside. The private pool is 10m x 5m, and has a large terrace on one side. Sunbeds and umbrellas are provided. The upper terrace measures 16 x 6m! An outdoor dining table and chairs are provided. The lower portico is 6 x 4m. Rattan seating, a table, chairs, corner seating area and barbecue is provided. Parking for several cars is available at the front of the house. Utility Room: Washing machine, ironing board/iron, additional fridge-freezer. Cleaning / Towels / Linen / Maid service: Bedlinen, bathroom towels, pool towels and tea towels are provided. The House is cleaned before every change-over; further cleaning can be arranged at extra cost. Other: Open-plan kitchen / dining room with large table and chairs seating 8. French doors leading onto huge upper patio with splendid views. iPod docking station. The Barn has its own large adjoining terrace, which can be accessed through large french doors. Sandy beaches at the sophisticated beach resort of Porto San Giorgio are approximately a 45 minutes drive away. The town of Servigliano was built according to town-planning rules of the 18th century. It is surrounded by high walls and accessed through 3 gates. Servigliano is only a few kilometres away, and offers shops, weekly markets, restaurants, cafe's, a bank and other everyday facilities. The City of Fermo, with its imposing Duomo, spectacular market square and winding alleys is a 30 mins drive away. Mountain walks are available in Mount Sibilini National Park which is approx 40 mins drive away. Booking Notes: Booking is via our booking form that we can email to you. Normally we ask for 50% deposit on booking, and the balance 8 weeks before the start date of your holiday. Payments may be made in EUR or GBP. Changeover Day: Changeover day is Saturday, alternative days by arrangement subject to other bookings. Arrival after 3.00pm. Departure by 10.00am. Notes on prices: Prices are for the property per week in Euro. Payments may be made in EUR or GBP.